The week didn’t quite go how UFC light heavyweight top contender Alexander Gustafsson (pictured) had envisioned, but it could have been much worse. Gustafsson tore the meniscus in his right knee earlier this week during a sparring session, which cost him a rematch against reigning 205-pound king Jon Jones. 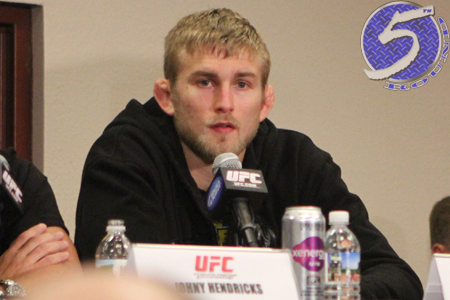 “I’m disappointed I can’t fight, but this is not the end, it’s just the beginning,” Gustafsson told UFC.com. “I’m going to come back much stronger. Gustafsson will have surgery to repair the wound shortly. The good news is that he is expected to be out only five to six weeks after the operation. However, that timetable may change depending on how his leg reacts to rehab. Jones defends his throne against Cormier on September 27 at UFC 178.